← What Does Developing Intercultural Competence Have To Do with Grief? How Can Majoring in a Language Help You Get the Job You Want When You Graduate? 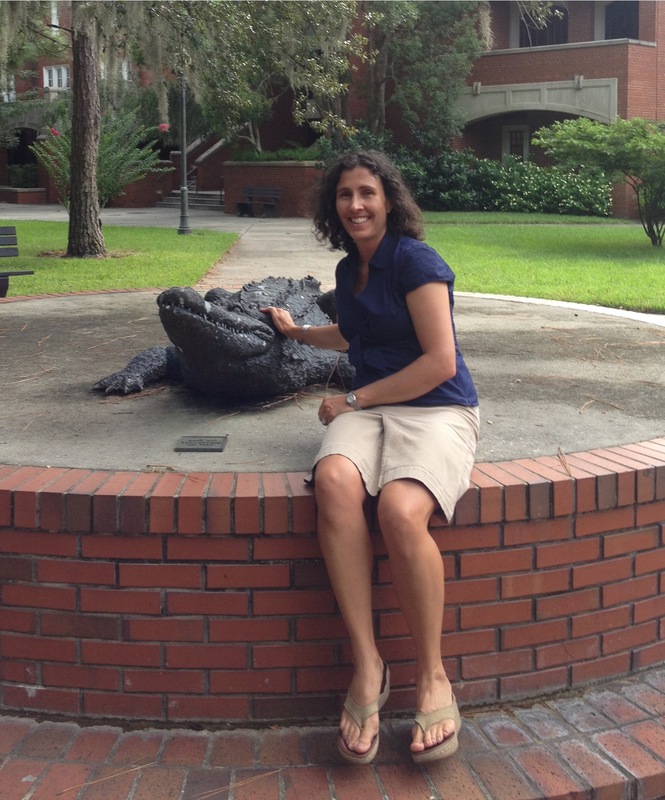 That’s the question I went to the University of Florida to answer for the couple hundred students who attended the Major Event, hosted by Gillian Lord, the Head of the Department of Spanish and Portuguese Studies. We know employers want new hires with these skills: written & verbal communication, organization, analysis, problem-solving, and decision-making. For example, they want someone who, on day one, can organize a meeting by sending out an email with the accurate day, date, time, and location. They want someone who can independently make decisions about document length, word count, font size, and margins when preparing the agenda for that meeting. Language students develop some of these vital skills in the first semester of study. Who hasn’t had the experience of failed communication? That’s a problem you have to solve. And when you solve it, your communication skills have improved. Most language students recover from miscommunication by organizing the language that they do know in such a way that the most vital information is conveyed. You can skip the verbs (and verb conjugations), forget about all the articles, prepositions, and conjunctions. 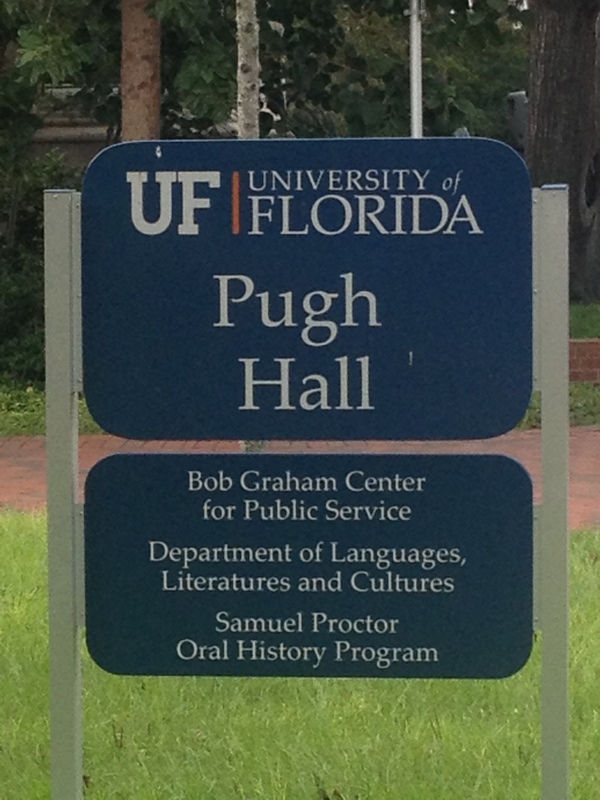 Just say ‘Wednesday…11th…5:00…Pugh Hall’–maybe include a picture or some other visual cues if you can. That’s how you survive the first semester of language study, but do you know how to use those survival skills to land you the job you want after you graduate? You have to be able to tell the employers that you have the skills they need. And they’ll only believe you if you have specific, detailed examples. So you start with that story of miscommunication, how you overcame the failure, and organized the most important information in order to successfully get everyone to Pugh Hall last Wednesday (or whatever the incident was for you). 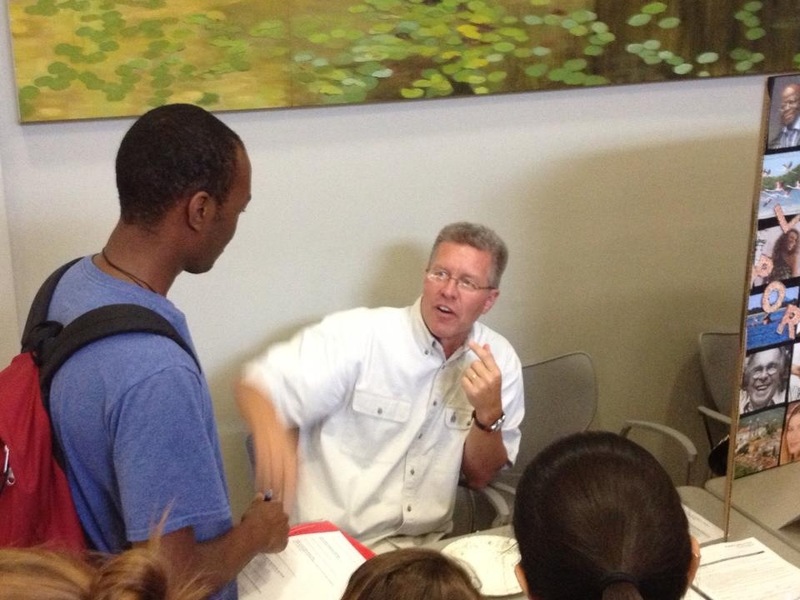 Greg Moreland, Spanish Undergraduate Advisor, talks to students about majoring in Spanish. Photo by Gillian Lord Ward. Then you have to tell the employer the broader lesson that concrete experience taught you. This is where you use those key words like communication, organization, problem-solving–after you have illustrated that you possess those skills through a specific example. You can’t just claim to have great skills. Once you have shared one experience that exemplifies the desired skills, then you explain the lesson you learned that you can apply to other aspects of your life and career. In this example, you learned the importance of staying calm in the face of failure so that you could solve the problem at hand–for example, by getting organized and prioritizing the most important information when communicating with others. Note the use of key words here. Spell it out for the employer. To make sure you are the candidate to secure the job, you should explicitly say how your skills will be applied within their organization. Sports broadcaster: When I started studying Spanish, I hated getting called on in class. I never felt like I had enough time to prepare my answer in Spanish. So I developed the strategy of preparing my answer as quickly as I could, then volunteering as soon as I was ready. Sometimes I made mistakes and the teacher corrected me, but I was ready to process the feedback and learn from the mistakes as long as I wasn’t flustered from being ill-prepared at the beginning of the interaction. I will deploy that same strategy on behalf of players and coaches when I am interviewing them at their most stressful moments–on the field at half time or in the locker room after a tough defeat. Instead of showing up with a live mic, a camera, and lights, in the most stressful moments, I will ask questions with only my phone’s voice memo app and a notebook & pen. Then I will go alone to the camera and report on live mic what the players and coaches told me, quoting them directly wherever possible. So ESPN, that is how I will use what I learned in Spanish 101 to be the best new-hire you’ve ever put on the field! 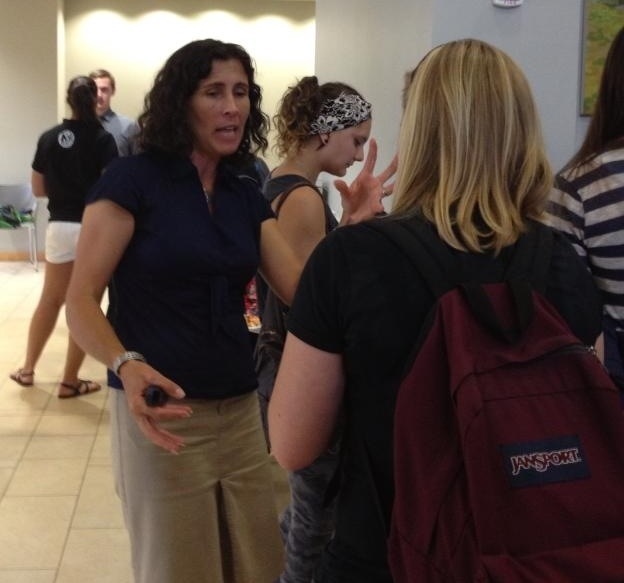 Darcy Lear talking to a student who wants to have a career as an interpreter. Accounting: In one of my Portuguese classes, we had to present on different national economic development projects Brazil undertook over the past decade. As the only accounting student in the class, I was the one who noticed the mistake when a team presented a growth from 4 to 6 exporting nations as a 200% increase. I didn’t say anything to embarrass those students during their in class presentation, but in the follow-up Q&A for all the other presentations, I asked for raw numbers whenever a percentage was presented and made a habit of calculating percentages whenever raw numbers were presented. It was a great way to practice my numbers in Portuguese and at the same time, I was able to see clearly how either a raw number or a percentage increase could be used to one’s advantage, depending on if you were the buyer or seller. This ability to critically analyze the relative nature of something so hard and fast as numerical data is something I will use every day of my career as an accountant here at Deloitte & Touche. Engineering: When I started studying Spanish, I was constantly embarrassed by what I didn’t know. I didn’t like to participate in class because I felt so limited in what I could capably say. Then one day we were doing a pair activity in which we had to introduce ourselves to each other. When I was having trouble thinking of the words to say “I am 19 years old” and I just kept pointing to myself and saying “19,” my partner helped me out by asking, “How old are you?” That triggered my memory and to this day I remember that expression very well. I realized that when I really needed to say something to communicate in Spanish, if I could act out part of it to a classmate, that person could often help me out. And I always remembered the Spanish I learned that way better than I remembered Spanish I learned any other way. As I opened up about participating in class, it quickly became obvious that everyone was struggling in one way or another with the new language we were all trying to learn, but I had been so focused on myself and preserving my own pride that I didn’t even notice my classmates at first. Now I can apply that to my engineering career–I know not to be so afraid of being wrong that I just isolate myself and fudge it to avoid embarrassment. My Spanish classes showed me that asking a peer to fill in some missing information for me helps me to gain new knowledge that I can retain and use over and over in all my projects. And my willingness to do that helps to build a collaborative environment in which others can also learn from me or check their work against my knowledge and experience. 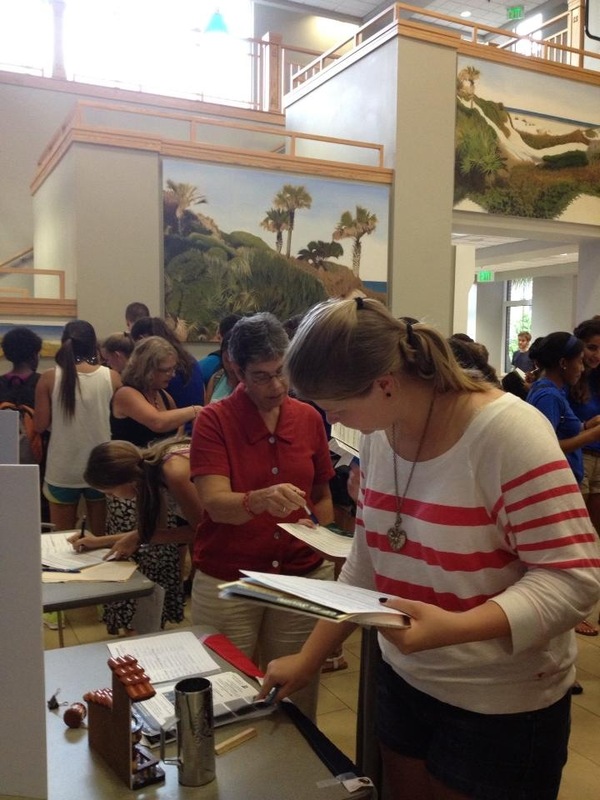 1 Response to How Can Majoring in a Language Help You Get the Job You Want When You Graduate? Those examples are perfect! Thanks for taking the time to type up those students’ individual stories, because they are examples that all students can follow.